The strategic prayer conference in Shetland Islands is still going and I just heard that things are shifting into gear. We left early but some of the Orkney folk are still there, including Miriam. – Great to see the prophets and apostles working together. – Great to see some old friends and acquaintances – Patrick Sookdheo (I met him in 1989 in Washington State), Martin Robinson, Pieter Bos from Netherlands, author of the excellent book “The Nations Called” and father of Rogier who founded Next-Wave.org and is an emerging church leader and pastor in Netherlands. Other leaders here included Mark Stibbe (New Wine), Martin Scott, Robert Weston (who did a good job in bringing things together) but really, I dont think anyone came to hear speakers. In fact, some of us were worried that we wouldnt be able to pray because of a full program. As it worked out – there was a good balance. Here are some more images and a movie. Silent 600k QT movie of prophetic dance, led by Andy Raine of Northumbria Community. Hannah Prittie sets up an interactive station. Hi there, just stumbled on your site and was surprised to see pictures of Fire from the North. 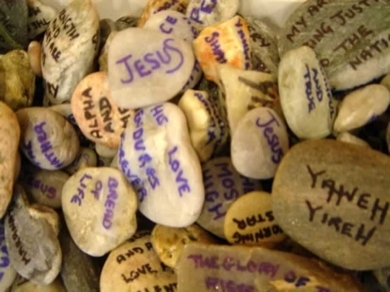 I am a Shetlander and was at the confrence, in fact my wife was the one who wrote the scriptures on the stone (pictured on your site). It is a great encouragement to see all of this on your site. May God richly and abundantly bless you my friend.